You know how normally you shouldn’t feel guilty when you’re eating vegetables? Well, that is definitely not the case with these green beans, but they are sooo worth all the guilt. The salty/crisp bacon, combined with the sweetness of the brown sugar makes these beans sinfully delicious! Talk about an amazing side dish to go a long with any meal. I made these two nights in a row and can’t wait to make them again. I’m not going to lie, after the dish was empty, I was sticking my finger in the buttery/sugary juice and just licking it. Even my Braydon who is the pickiest eater on this planet, tried a couple and liked them! That is huge considering the fact that last time I made him eat a fresh green bean, he gagged and threw it up. 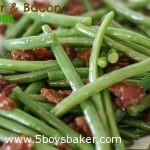 With summer here and fresh green beans so easy to find, I would definitely use fresh over frozen. You have to try these, but promise me that you won’t hate me after you eat the entire pan. In a large skillet, fry the bacon over medium heat until just crisp. Drain off grease and add butter and brown sugar. Cook, stirring occasionally, over medium heat until the brown sugar has dissolved. Place the green beans in a pot and fill with about 1 inch of water. Bring water to a boil and then place the lid on the pot. Steam the beans over medium heat until cooked through, about 5-8 minutes. Drain the water from the beans, season with salt and garlic salt, and stir in the sugar and bacon mixture. Serve immediately.